After WWII, the Feds started paying serious attention to the types of degrees college students completed. They had been compiling educational statistics since 1870, but Vance Grant explains (in the historical overview here) that increasingly detailed surveys of higher education were funded in response to the post-GI Bill boom. Currently, the National Center for Education Statistics (NCES) reports degrees conferred by field of study going back to 1949-50 in its Digest of Education Statistics. In 1966, the Higher Education General Information Survey (HEGIS) made major improvements in the granularity and scope of data collected. Institutions of higher education were asked to report degrees awarded under standardized numerical codes designating the field of study. (I have yet to determine the reporting mechanism for 1949-1966 surveys.) In reporting on degrees awarded in 1986-87, Classification of Instructional Programs (CIP) codes replaced HEGIS as part the Integrated Postsecondary Education Data System (IPEDS, here’s a history). This was a lengthy bureaucratic process rather than a wake-up-and-take-a-CIP kind of change, but for the sake of clarity let’s just stick with 1986 as the Dawn of CIP. I am sure you have already intuited the genius of CIP. It is so obvious! One simply lops off digits to arrive at higher levels of statistical abstraction. Thus the four distinct series under 23 English Languages and Literature/Letters (23.01 English Language and Literature, General; 23.13 Rhetoric and Composition/Writing Studies; 23.14 Literature; 23.99 English Language and Literature/Letters, Other) can easily be collapsed into the area code for English: 23. One can perform the same trick with the six different varieties of 23.14 Literature (23.1401 General; 23.1402 American (US); 23.1403 American (Canadian); 23.1404 Brittish; 23.1405 Children’s and Adolescent ; 23.1499 Other). This allows institutions to track degrees at the level of granularity meaningful to them, while facilitating the kind of aggregation that makes results meaningful to those thinking about trends across the higher ed sector. When the Digest of Education Statistics compares degrees granted over time in various disciplinary areas, in considers the top level (two digit) CIP code by default. Degrees in Literature (whatever sort) will show up along with Rhetoric and Composition under 23 English Languages and Literature/Letters. Degrees in Film/Cinema/Video Studies will show up with degrees in studio art, music, “arts, entertainment, and media management” and so on under CIP 50 Visual and Performing Arts. I find a number of points of interest in this. Although it seems almost too obvious to state, English takes up a lot of real estate on this list. 54 History, by comparison, only contains one series with 9 parts. The level of granularity makes no difference to the aggregate totals (it shouldn’t), but it seems to point to something about disciplinary structure. What generates the need to distinguish so many flavors of English? History also has “general” and “other” categories, for example, but English seems to need them at the 23.14## level as well as the 23.## level. Why 23.1499 English, Literature, Other as distinct from 23.99 English Language and Literature/Letters, Other? Their definitions differ by a single word. 23.1499: “Any instructional program in English language literature not listed above.” 23.99: “Any instructional program in English language and literature not listed above.” Does this result from taxonomic logic merely or are there really hyper-specialized degrees out there that require this distinction? Is it an attempt to capture approaches at different types of institutions (Research 1s and Community Colleges,e.g.) and/or levels (PhDs and AAs)? Inquiring minds want to know. Another kinda obvious point: while “English” and “History” designate both disciplines and commonly encountered administrative divisions (departments), the same cannot be said for 50 Visual and Performing Arts. At my institution, for example, the degrees encompassed within this category are spread out not only across different departments but also across different colleges: 50.09 Music has a Dean; while 50.06 Film/Video and Photographic Arts does not designate a coherent institutional entity at all. Precisely because the point of CIP taxonomy is to report degrees and not departments, we can see a much closer fit between institutional organization and taxonomic organization in the case of History and English than with Visual and Performing Arts. With respect to the latter, there is a striking disjuncture between the discourse that reports on the credentials higher education confers, on the one hand, and the institutional organization producing those credentials, on the other. At the level of aggregated data about “Visual and Performing Arts,” the institutional arrangements that credential students disappear entirely in favor of a new unity produced by the taxonomic scheme. 23 English is also an unity generated by the taxonomy, but looking at the series it comprises, one can imagine actually existing departments. Curiously (kinda obvious point number three), the term “humanities” organizes practically nothing in this schema. CIP code 24 Liberal Arts and Sciences, General Studies and Humanities is clearly meant as a designator for generalist degrees and not as rubric encompassing disparate disciplines. In contrast, CIP 45 Social Sciences has under it Anthropology, Archeology, Criminology, Economics, etc. NCES does sometimes combine CIP codes to report trends in the “humanities,” but that requires an explanation of what gets lumped (see below). Reporting about “Social Science” does not–although History does get combined with Social Science in the same tables that report on the humanities. Is the “crisis of the humanities” partially, or maybe even primarily, taxonomic? includes degrees in Area, ethnic, cultural, and gender studies; English language and literature/letters; Foreign languages, literatures, and linguistics; Liberal arts and sciences, general studies, and humanities; Multi/interdisciplinary studies; Philosophy and religious studies; Theology and religious vocations; and Visual and performing arts. James English is able to make the kind of argument he makes about English not so much because of its numerical strength but because of its institutional power, because, among other advantages, of the very good fit between the taxonomy that measures it and the departmental structures that sustain it. This is implied by his argument and worth underscoring. That fit does not exist for those fields whose faculty and curricula may overlap with English but also have disciplinary autonomy, e.g,: 30.2601 Culture Studies/Critical Theory and Analysis, added in 2010 to CIP 30 Multi/Interdisciplinary studies (along with Mathematics and Computer Science, Gerontology, and Historic Preservation and Conservation); and 05.0201 African-American/Black Studies, part of 05 Area, Ethnic, Culture, Gender, and Group Studies (along with German Studies and Tibetan Studies); and of course 50.0601 Film/Cinema/Video Studies. James English makes some astonishing claims about degrees in these fields. If we start from the contrary assumption that “cinema studies, ethnic studies, women’s studies, culture studies, African American studies, and Asian American studies” exist because scholars and students weren’t satisfied with the guidance they were getting under the English umbrella, it’s less easy to deny their disciplinary identity. (50.0601 definitely thinks it is a discipline and not a wayward child of 23.0101; I’m just sayin’.) Moreover, if we look at the CIP’s within Area, Ethnic, Culture, or Gender Studies, we discover that James English’s overhasty generalization may lump together very different types of programs (African-American Studies likely has a joint appointment in the English Department, German Studies may not). Because I like English’s book overall, I don’t want to brand him a typically imperialist English professor. Can we just stipulate that the small but rapidly rising numbers are probably not best understood as “hidden” English majors? Unless, of course, they get aggregated in that way, through the two-step that turns them into “humanities” majors and then establishes English as the dominant discipline in that sector. It’s more interesting, I think, to play with the granularity that IPEDS affords, which anyone can do with the handy dandy report generator here. Do these numbers describe the campus you inhabit? Mine make sense to me but they do provide a new perspective. History and English, which seem ginormous on the ground, don’t look that way in this comparative view. Visual and performing arts, which does not seem to be a coherent area at all on my campus, looks like a major one in the numbers. Some of the degrees there to do not look like “the humanities” to me, but a great many of them do. This suggests that a major thread of development in the humanities may already be precisely where we think it should be: in engagement with the full range of culture industries. The bottom line: it is a good thing we’ve been paying our taxes because IPEDS will help us describe the humanities differently (and let’s hope the Department of Education stays in business). But it will be necessary to dive into the data, rather than rely on the Digest exclusively, and we have to figure out how disciplines like film were counted before they were counted, which may mean research at particular institutions. This entry was posted in The conflation of humanities and English, Working With and Within the Culture Industries on October 13, 2012 by mark. I think I can fill in some of the genealogy. To me the quotation highlights the some the more troubling aspects of Red Book rhetoric. In particular, it dodges the central governance question. The idea here, I take it, is that the perception of civilized unity inculcated by general education will allow the myriad small societies to work in concert to open that good-life door. Yet all actually existing societies I know about comprise groups with competing practices, values, and interests, even if they may be said to be united by other practices, values, and interests. The Red Book’s authors may hope that general education will provide a foundation for the adjudication of competing group interests. They do not, however, envision plausible mechanisms whereby generally educated Americans might meaningfully participate in such feats of adjudication, nor is such judgment the kind of thing that general education in the humanities or social sciences seems particularly designed to encourage. The emphasis is on unifying works of durable value. If general education does not equip generally educated citizens to question what is meant by “the good life” and for whom, then “unity” and “civilization” become alibis for the status quo. In the hope that functioning small societies might through a vague process of magnetic conduction improve the common weal, I hear the echoes of Charles Beard’s college textbook American Government and Politics, which went through six editions between 1911 and 1931. Beard taught Arthur Schlesinger, the historian on the Red Book collective, when the later was a graduate student at Columbia in the early 1910s. It may be Schlesinger who gives the Red Book its organizing “Jeffersonian” and “Jacksonian” metaphors. His autobiography could offer a clue. In any case, in an epilog entitled “How can citizens play well their part in the development of American political society?,” the 1931 edition of American Government and Politics confronts a problem of bureaucracy that Beard had addressed the year before in American Leviathan. To whit: the machinery of the state has grown too vast, and its mechanisms too sophisticated, to be susceptible to informed direction by the masses of citizens. The sorts of participation idealized in the Early Republic’s vision of democracy–public debate, elections, and so on–seem feeble in the face of increasingly sophisticated public relations efforts by political parities and pressure groups, not to mention an ever-increasing number of bureaus only nominally controlled by elected officials. How could young citizens hope to affect a political culture so obviously controlled by experts paid to control it? Beard’s advice is to join “small societies”–political parties as well as business, professional, labor, and civic groups–and to hope to influence the broader direction of politics by influencing these smaller groups. I am proposing that the Red Book marks itself as a twentieth-century work in its hope that the kind of political participation that we might think of as a hallmark of neo-liberalism will secure the type of republic idealized by classical liberalism. In the US context, probably all wishes along these lines respond in one way or another to the argument between Walter Lippmann and John Dewey inaugurated by Lippmann’s 1922 Public Opinion. I’ve written about this at length elsewhere (in Love Rules), and I won’t drag you through it all again. We may never know a more effective critic of Jeffersonian ideals than Lippmann, who treats the entire edifice as a massive PR exercise that convinced Americans to confuse the procedures outlined in the Constitution with self-governance. The PR machine was perfected under Jackson, he argues, when the political parties learned how to use Jeffersonian imagery to legitimate themselves. Henceforth, voting on agendas shaped and decided behind closed doors could count as public rule. Lippmann’s overarching critique centers on the power of media to define what citizens can know about the world that they are invited to help “govern.” Famously, for Lippmann media do not promote communication so much as circulate stereotypes–reductive views of the world that get mistaken for the world itself. After Lippmann, I think, any serious argument about democracy had to take on board a theory of mediation. Certainly Dewey does in his riposte, which advocates a program of continuous community-building education more radical than the Red Book authors could countenance, but that probably informs their appeal to education as an instrument of unity. In later posts, we’ll deal with the Red Book’s limited treatment of mass culture as a competitor to general education in uniting American society. Here, I’ll just note that the issue of mediation is a serious and indicative omission from their account of general education’s supposed democratic benefit. To change how people are governed requires changing the shared signs and symbols that make modern governance possible. I think it possible that the Red Book authors know this perfectly well and see themselves as engaged in such an adventure. They just don’t think that knowledge about how this works this should be part of general education. Their proposed course on American Democracy, for example, leaps over the Lippmann-Dewey debate. Students will read only defenses of classic liberalism: Tocqueville, Bryce, and Myrdal’s An American Dilemma (219). References to Jefferson and Jackson make it seem like the Red Book authors are talking about education’s contribution to a long heritage of American democracy. They are not. As they sometimes acknowledge explicitly, they are really talking about the role of expanding twentieth-century educational institutions in identifying and encouraging talent and in defining and inculcating social norms. In this project, educational institutions have a great many competitors as well as collaborators. A real commitment to democracy would require an educational program encouraging much harder questions of actually existing governance in the present. This entry was posted in Expert labor, Red Book, The neoliberal university on July 29, 2012 by mark. 2. A Jeffersonian matter? Funding merit. With Chris Hayes and Althusser you point out that the language of merit can ratify privilege. (For Hayes, this is because of the contradictory principles of difference and mobility inherent in meritocratic systems, for Althusser it would because, in “the last instance which never in fact arrives,” capital has structured the rules according to which merit is judged merit.) I also take the (mostly implied) point that even when we “see through” merit to the privilege it ratifies, you and I will continue to believe in meritocracy anyway, because our professional practice is inconceivable without it: we’d be different people in a different line of work. No question of getting outside this ideology, only, perhaps, of exploiting its contradictions. One answer to your question, then, is that the already “meritorious” want to fund meritocracy and that, insofar as they have the resources to do so, they may be likely to fund merit in ways that undermine meritocracy by exempting their own values and interests from challenge. This leaves your intriguing suggestion that the 20th Century’s educational institutions may have exhausted the meritocratic rhetoric that justified them, such that “meritocracy” can no longer be appealed to as a reason for funding public universities and, more particularly, humanities disciplines. If this suggestion is correct, the exhaustion of the old order would create an opening for alternatives that would appear horrifying or lovely, depending on one’s point of view and ability to apprehend them. In the “America needs talent” universe of the Redbook it was imagined that properly funded high schools would do the sorting, and also that the cost of college would pose no obstacle for the meritorious student. Students certified by the very best colleges could confidently claim to have obtained their credentials due to talent. With a Jacksonian general education in place, they could also claim that those credentials certified a certain kind of public virtue, an exposure to the stuff of the commonweal, particularly as rendered in classic works of fiction. Even in 1945 this was an ideal. The Redbook authors’ insist throughout on the wide disparity in the quality of high school and college experiences. If high school disparities are regarded as a problem, college disparities, as you note, are regarded as inevitable. The authors take for granted that vocational, junior, and 4-year liberal arts colleges differ (178-180) and suggest a place for general education in each before focusing on Harvard as a test case. I find no argument in the Redbook that college should be publicly funded. The argument, rather, is that Harvard should and will provide financial assistance to “broaden the economic base from which its students are drawn” (184). Clearly, others had made and would make an argument for publicly funded meritocratic universities–not least those responsible for the Morrill Act. We probably need to look more closely at some of those arguments. So long as the Redbook provides our example of mid-century rhetoric, however, it’s worth underscoring a fact that emerged via our last round of exchanges: the authors give the humanities (and especially English) a special role in Jacksonian leveling but not so much in Jeffersonian sorting. When Harpham appeals to Redbook-era clichés, he’s reprising a move barely hinted at in the Rebbook itself. That move marries the work of literary eduction to specialization in literary reading and thereby makes the role of English in “general education” depend on special expertise, talent, and sensitivity. The Redbook and “Criticism, Inc.” are not merely contemporaries, but structural complements, the role prescribed for English in general education makes no sense absent the kinds of professors Ransom (and Leavis) believe should be trained. It is this compact, established at mid-century, that the second half of the century brought to ruin. The proposition that a healthy nation needs general education that includes the humanities is alive and well. More about this in a later post. For now, at the risk of belaboring the point, I just want to underscore that the Redbook’s “America needs talent” argument includes, but only by implication, a call for talented humanities specialists capable of engineering the leveling functions of general ed (206-07). Were the Rebooks authors to make this argument explicitly, they would hazard looking like their great antagonists: propagandists and advertisers (266). Back to the present. Despite the dominance of “college for all” rhetoric, I think we continue take for granted the idea that “college” is a tiered market of different types and qualities of institutions. I also think we continue to imagine that excellent K-12 education should ideally be equally available for everyone (even though it manifestly is not). Doubtlessly the fact that K-12 education is, for the most part, compulsory in the US has a great deal to do with this. (I wonder what the Carnegie poll results you cite would be if, after being asked whether higher education should be a “right,” respondents were also asked if it should be required?) If “college for all” has not changed these assumptions, then it contains a meritocratic logic within it: the assumption is that everyone will be able to get into and attend some college or another according to their merits; not everyone will be able to get into every college; some BAs will be more equal than others. In the Carnegie poll, 67% of respondents said that funding was the greatest barrier to attending college. Which college, one wonders, did they have in mind? The “best” college to which a student is admitted? Any college whatsoever? It’s unclear to me that for any given student there would be a huge difference, although marketplace intuition says it’s always possible to buy up. My main point is that the question ambiguates the difference. It allows us to imagine that “attending college” equals “attending any college” and simultaneously that it means “attending the best possible college for that student.” The rhetorical shift from “America needs talent” to “college for all” is perhaps best grasped, then, not as a move from meritocracy to equal opportunity, but as a shift in emphasis from the nation’s needs to the individual’s. Both formulations, it seems to me, rely on old-fashioned liberalism’s logic that society and individuals have opposing interests that should be balanced. I think we both regard that logic as powerful, but bogus. This may suggest an avenue for further comment along the lines of pointing out that individual merit is meaningless except in reference to group norms. I know I’m leaving a lot of threads dangling, but indulge me in one more. Bill Gates, interviewed by the Chronicle on the Morrill Act anniversary and at the height of the Sullivan episode , speaks unapologetically about what business leaders want to bring to higher ed: a set of approaches geared to identifying best practices and solving those structural problems affecting large numbers of students. Public enemy number one: completion rates. I’ll go out on limb here and declare that not only am I not against improving completion rates, but also that I think Gates is right to identify this as the kind of issue with which business leaders should be concerned. I acknowledge the problems involved in treating completion as a reliable metric made apparent in here. Nonetheless, “completion rates” gives Gates a way to ask about what Universities are doing to deliver what they say they’ll deliver without telling them what they should deliver (in terms of curriculum, e.g.). Does this Jacksonian emphasis amount to a rejection of funding meritocracy? Not at all. Gates says he funds “change agents” who model the best practices that improve completion rates. There is a lot of room for humanities expertise here, it seems to me. No surrender of clichés would be required. Critique and completion are compatible. What might be required are changes in how the workforce is structured, how the curriculum is imagined, how space is used on campus, etc. So my answer is that funding for meritocracy is not in jeopardy, but meritocracy may well be depending on where the funding for it ends up coming from. We have not arrived at a new day in which established defenses of general education, talent, and “critique” have lost all traction. What has broken down are the mechanisms conjoining these rhetorics (ideologies?) with the actual practice of humanists, who look most out of touch not in the content of our scholarship (who reads most of it anyway? ), but in the institutional configurations we tend to defend. Defend is the right word. Where’s the offense? This Chronicle headline may be relevant. This entry was posted in Red Book on June 29, 2012 by mark. institutional practices that are guided by particular examples, especially by examples that have functioned as very important in our early attraction to a practice or discipline, would seem less susceptible to balkanization, more likely to provide the basis for establishing new relations, than practices wedded to objects. I like examples because, in the same gesture, they explain to me both why Shakespeare is more important to me than Soyinka and why Soyinka is important to me. I think we can agree, but agreement requires us to put back on the table some features of disciplinarily that have dropped out of our last few exchanges. If this remains our goal, and I think it does, then we need to remember that the risk of talking past one another remains significant. “What is film?” and “What is Literature?” are not even the parallel disciplinary questions they may appear, because (as our discussion of “realism” brought out), consideration of the material carrier (e.g., photosensitive emulsion on a flexible plastic base) has been front and center in film studies, whereas in English that question was largely consigned to the marginal subfield of “the history of the book,” until the impending demise of the codex brought it out retirement under the banner of digital humanities. Words like “film,” “print,””media,” and “mediation” mean differently in the disciplines that, like it or not, shape our approaches. Object-orienation points not to a consensus about what the objects are or how they differ from other objects, but to the unruly disputes, shared vocabularies, acknowledged and unacknowledged premises that animate academic practice. If objects keep disciplines in their lanes (as you say), they do so in part by making it difficult to recognize what’s going on next door, even when we’re looking right at it. The conceptional shift from objects to examples helps us here, because it requires us to ask “what is exemplified?,” a question more likely to disclose incommensurate premises and zones of dispute than the question “does this differ from that?” Understanding differences of exemplification strikes me as a necessary first step in developing shared examples. I am not taking back my initial point that examples are not unities. We cannot say in advance that examples point to commensurable explanatory contexts for which they are examples. But I am qualifying this point, because it seems to me that any decent explanation of that incommensurability is bound to transform the example into the common property of a new explanatory context. I am trying to decide whether this notion runs counter to your “fantasy in which we become more specialized and, as a result, less self-sufficient.” I find the idea of specialized teamwork inherently appealing but practically difficult to imagine without shared examples capable of permitting a collective organization of the labor. Absent such organizing examples, self-suffcient specialization sounds to me like alienation. I might have a sense of myself as a highly specialized cog in a machine without much idea of how I participate in its overall function. This may in fact characterize the academic humanities at the moment. I take that to be one way of reading Ralph’s comment about the uncertainty involved in conceiving the adversary these days. This entry was posted in And in favor of humanities "examples", Collaboration, Why we are against humanities "objects" on June 10, 2012 by mark. I recently got notes from Ralph Berry about our presentation at Florida State. The value we place on “collaboration” was a central topic. Ralph reminded me of the Q&A in which some questioners pointed out that “collaboration” does not have a purely positive connotation. Sometimes “collaborators” are enemies of the cause. There’s a big difference between those who collaborate with “us” and those who collaborate with “them,” but, at least in the fictions that deal with this problem, it’s not always easy to tell who’s who. In Casablanca, for example, Louis collaborates with the Nazis right up to the end when he and Rick begin again, but of course this beautiful new start is possible because he and Rick have been collaborating all along. And although Rick says he sticks his neck out for no one and seems to be quite a loner, he’s clearly an arch-collaborator, forming ad hoc partnerships and knitting them together so that Ilsa and Lazlo can catch their plane. Collaboration entails an idea of the common good and an epistemological uncertainty about it. This twofold proposition is encapsulated in the photo we showed during out talk. (I’ve added it here before, but you suggested we table discussion . . . until now!) The image captures a struggle to define the terms of collaboration. Graphic Artist One (Billy) sets collaboration over competition. In denying Billy anonymity, Graphic Artist Two negates his statement by disallowing the standpoint from which he makes it. 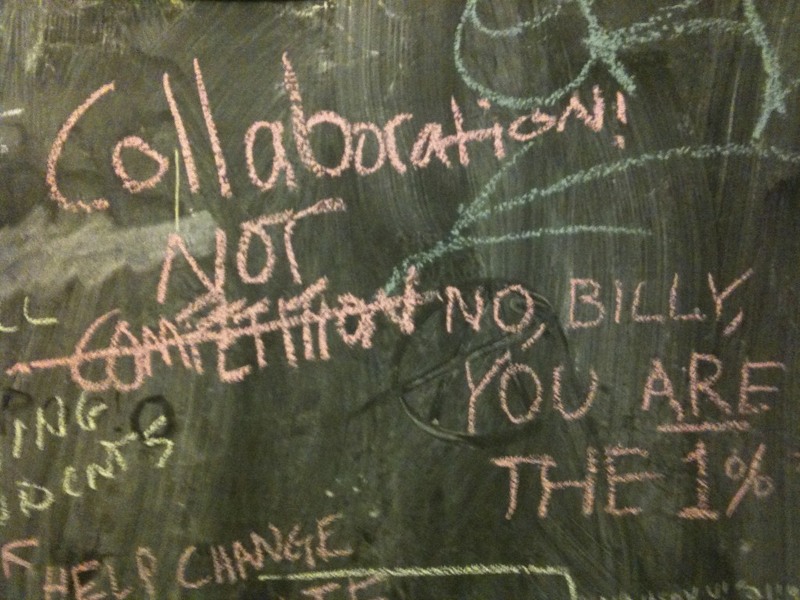 The idea here is that persons belonging to the 1% have no authority to assert the value collaboration over competition. Such a statement is hypocritical because the 1% benefit from a competitive process that unfairly privileges them above the 99%. Probably there is more going on outside the frame. We are free to imagine the Graphic Artist Two feels an animosity toward Billy that far exceeds, and may be largely unrelated to, their relationships to the distribution of wealth. In any case, it seems that Billy wants to be one of “us,” while Graphic Artist Two insists, no, you are one of “them,” a collaborator with the competitors. This interpretation assumes that “Collaboration!” and “NOT COMPETITION” have the same author. The handwriting looks the same, although the shift to all caps may introduce an ambiguity: a different time of writing or simply a matter of emphasis? The line through “competition” presents a more serious conundrum. Are we to regard it as part of Graphic Artist One’s initial statement–an iconographic negation of competition to underscore the semantic negation of the “not”? Or is this part of Graphic Artist Two’s statement? If the later, we can understand it as a kind of double negative. Graphic Artist Two iconographically invalidates as bad faith Billy’s semantic negation of competition, while leaving the imperative “Collaboration!” untouched. I like this second interpretation. It seems to be of a piece with Graphic Artist Two’s cynicism: a reminder that while collaboration might be valued over competition it cannot be opposed to it, since would-be-collaborators begin from a position in a competitive hierarchy with which they may unwittingly collaborate despite avowals to the contrary. The image-arugment thus encodes the complex proposition that “collaboration” entails an opposition, a “them,” and that the ground for the us-them distinction is inherently unstable. It is easy to break collaborations apart by denying the principle commonality that unites them. It is perhaps equally easy to find alternatively commonalities, grounds for collaboration where none seemed to exist. Which is to say, I suppose, that collaborations exist as they are practiced and not as they are planned or defined. Professors of literature are learned but not critical men. The professional morale of this part of the university staff is evidently low. It is as if, with conscious or unconscious cunning, they had appropriated every avenue of escape from their responsibility which was decent and official; so that it is easy for one of them without public reproach to spend a lifetime in compiling the data of literature and yet rarely or never commit himself to a literary judgment. Nevertheless it is from the professors of literature, in this country the professors of English for the most part, that I should hope eventually for the erection of intelligent standards of criticism. It is their business. Do we collaborate with Ransom in trying to figure out 1) what it means to be an English professor and 2) how this could be made more satisfying work? I think we might when we use him to call attention to assumptions that continue to inform the practice of the discipline, even if few current practitioners would explicitly avow the whole “Criticism, Inc.” package. This entry was posted in Expert labor, Why we are against humanities "objects" on June 4, 2012 by mark.